In order to better understand how the world viewed the US 2016 presidential election, the issues that mattered around the world, and how nations made sense of how their media systems constructed presentations of the presidential election, Robert S. Hinck, Skye C. Cooley, and Randolph Kluver examine global news narratives during the campaign and immediately afterwards. 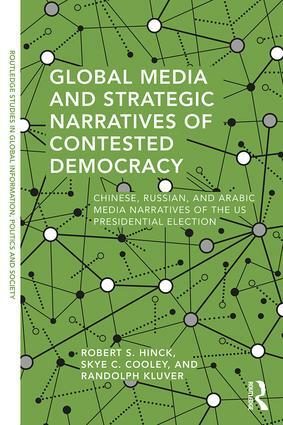 Analyzing 1,578 news stories from 62 sources within three regional media ecologies in China, Russia, and the Middle East, Hinck, Cooley and Kluver demonstrate how the US election was incorporated into narrative constructions of the global order. They establish that how the narratives told about the US election through national and regional media provides insight into how foreign nations construct US democracy, and reflect local understandings regarding the issues, and impacts, of US policy towards those nations. Avoiding jargon-laden prose, Global Media and Strategic Narratives of Contested Democracy is as accessible as it is wide-ranging. Its empirical detail will expand readers’ understanding of soft power as narrative articulations of foreign nation’s policies, values, and beliefs within localized media systems. Communication/media studies students as well as political scientists whose studies includes media and global politics will welcome its publication. Robert S. Hinck is an assistant professor in the Department of Communication Studies at Monmouth College. His expertise is in rhetoric, strategic narrative, and political communication. Skye S. Cooley is an assistant professor in the School of Media and Strategic Communications at Oklahoma State University. His research centers on Russian political communication, global media and digital democracy, as well as developing and testing platforms for civic deliberation online. Randolph Kluver is the Dean of the School of Global Studies and Partnerships at Oklahoma State University. He has published widely in the fields of new media, Asian politics, the internet in Asian societies, public diplomacy, and international communication. Dr. Kluver serves on the editorial boards of the Journal of Communication, the Journal of Computer-mediated Communication, the Asian Journal of Communication, New Media and Society, China Media Research, and the Western Journal of Communication.